Everybody knows: I am a Mugler girl! I love to watch videos of old Mugler fashion shows and even if I like a lot of perfumes, there is one I always return: Mugler's Alien, my only true love when it comes to perfumes. Therefore I was very curious when I heard about Aura, the new Mugler scent. I just knew that it must be innovative and different to all the mainstream on the perfume shelves. 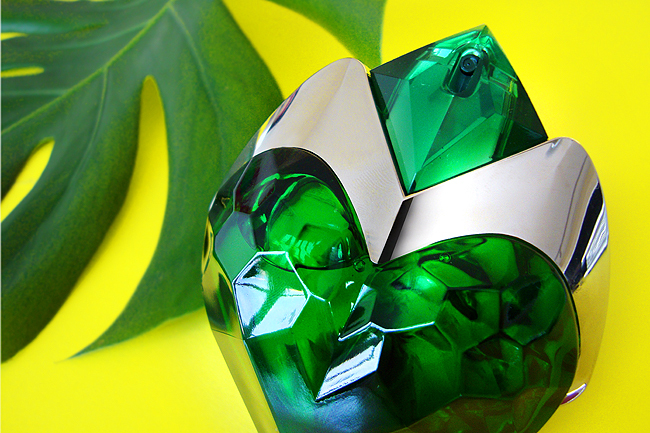 The emerald green bottle looks unmistakable Mugler and extraordinarily beautiful. Like all Mugler flacons, it's refillable which is a big plus in times when sustainability becomes more and more an issue. Like Angel and Alien, its name starts with an "A," standing for the brand's theme "addiction. The silver part of the bottle forms an "M" for Mugler like a bold signature. But let's move to the essential thing and discuss how it smells: Aura is a woody aromatic fragrance. It features rhubarb leaf, tiger liana, orange blossom, bourbon vanilla and wolf wood. 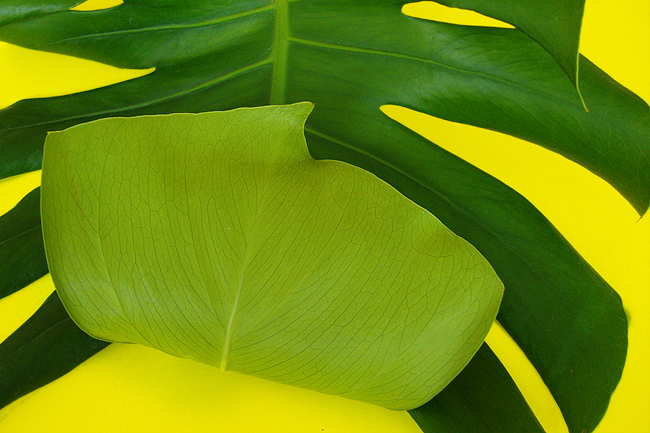 The concept of Aura is "botanical meets animal, " and it creates a magical aura with an overdose of both two components. My first impression was that it's a sweet but somehow wild musky scent. Not as crazy as Angel and Alien, but challenging and imposing. 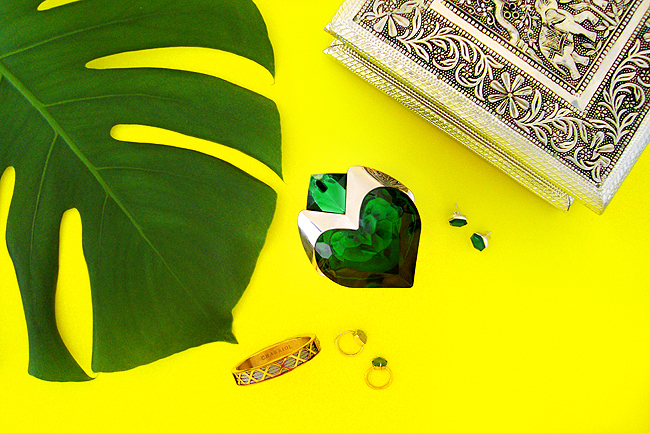 I have to think of Emerald City hidden in a thick jungle when I see the beautiful green heart. After wearing Aura for few times, I like it even better, and it grew on me. I caught myself smelling my wrist very often while wearing it and missing it when it's gone. 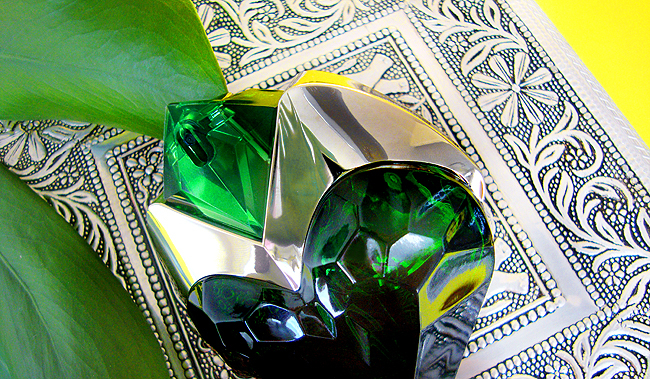 Like all Mugler perfumes, Aura is not everybody's darling, but the seekers of uniqueness will fall for it not despite but because of its edginess. Wearing Aura is not a safe play, but a fragrance for the adventurous woman on a bold journey called life. Aura, you will sit next to Alien on my shelf, and I'll be happy to have you keeping me company and telling me to listen to my feline instincts! Yes I am addicted.